It's full steam ahead in this five-reel, 20-payline game of maritime adventure from NetEnt. 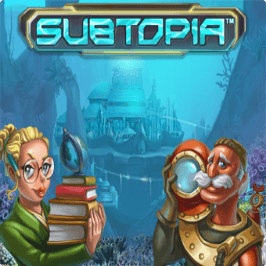 Along with an evocative underwater vibe, Subtopia offers a frequently triggered bonus round and an unusually high payout percentage. Up periscope! Play Subtopia for Real Money! 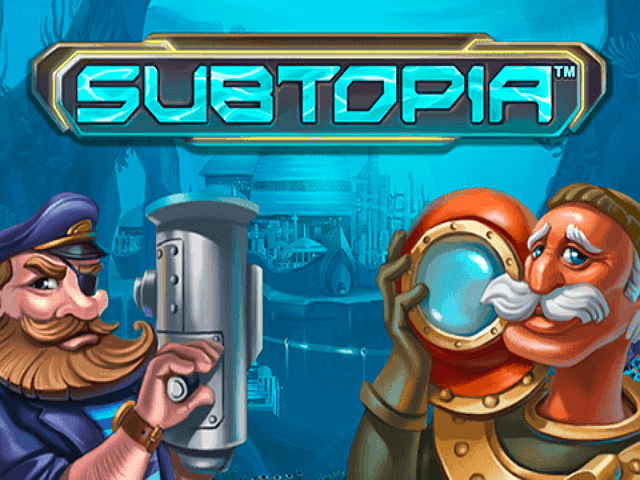 Subtopia’s theme is essentially one of submarine-based shenanigans as the action revolves around a rather motley crew of treasure-hunting characters who all seem to live aboard a slightly steampunked vintage submersible. Think Twenty Thousand Leagues Under the Sea mashed-up with the Atlantis myth and you’re about there. You, as the player, enjoy a view from within the sub, so the reels spin on a window (porthole?) which itself looks out over a strange underwater city. A less-is-more soundtrack of sonar bleeps and bubble exhausts adds nicely to the mysterious, under-the-sea ambience. The torpedo-like audio effect made by the reels when you press ‘spin’ is pretty cool too. 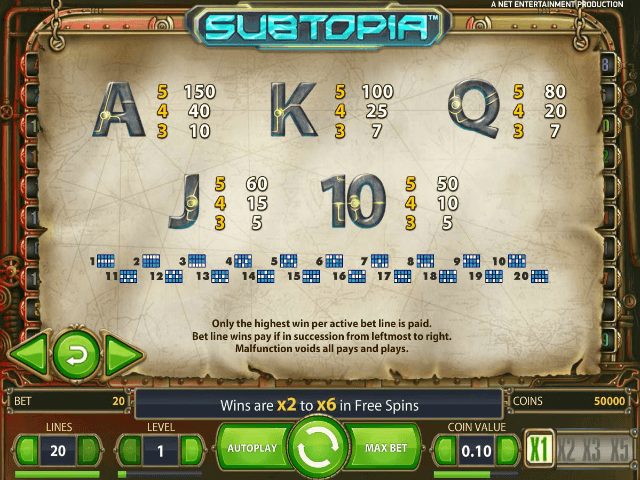 The stake levels on the Subtopia slot game are adjustable and the minimum and maximum cost per spin is 20p and £100 respectively. It’s worth noting that the paylines are fixed so you must have all of them activated and in play on every spin you make. The RTP comes in at a very impressive 96.10%. The Subtopia slot has standard playing cards as the low-value symbols and uses the nicely rendered cast of characters as the high-value ones. This cast includes a purple-haired engineer, a mustachioed deep sea diver, a blonde scientist, a red-haired navigator and a captain replete with beard and eye-patch. There’s also a random multiplier symbol which appears throughout the main game. The wild is a golden idol and the scatter is a compass. 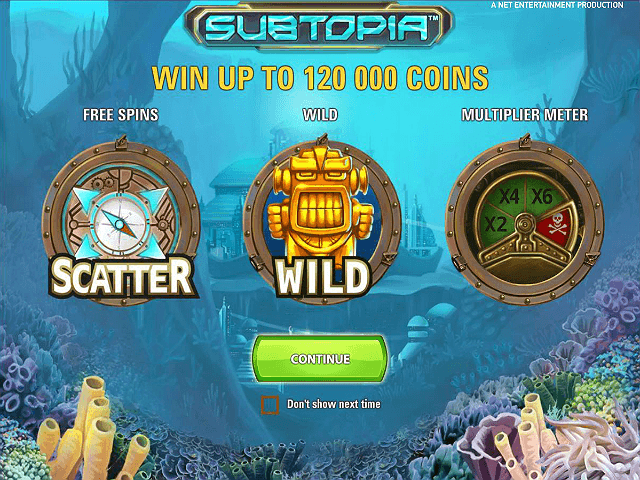 Whilst there’s no bonus game as such, the Subtopia online slot game does have two notable special features. The first of these is the ever-popular free spins game which is triggered by hitting three or more of the scatter symbols. A Multiplier Meter pops up to the bottom right of the reels for some of these spins, randomly increasing your winnings by a factor of 2-6x. Although the number of free spins you can get during this round is (in theory, at least) unlimited, the feature ends when the Multiplier Meter stops on the skull and crossbones symbol. The second notable feature is the Random Multiplier, an innovation which instantly changes the amount you can win on any given spin. The Random Multiplier gauge sits in the bottom-right corner of the screen where it more often than not remains at the lowest setting (x1) to show you’ll be winning prizes at normal levels. Some spins cause the gauge to increase randomly though – to levels of x2, x3, or x5 – multiplying anything you win on those specific spins by the respective amount. Whilst it might be lacking snazzy animations or thrilling features, the Subtopia slot scores very highly in the gameplay and ambience departments. Having the chance to unexpectedly win a massive prize on any spin via the random multipliers is a pretty big draw too. Share this Subtopia Review today! 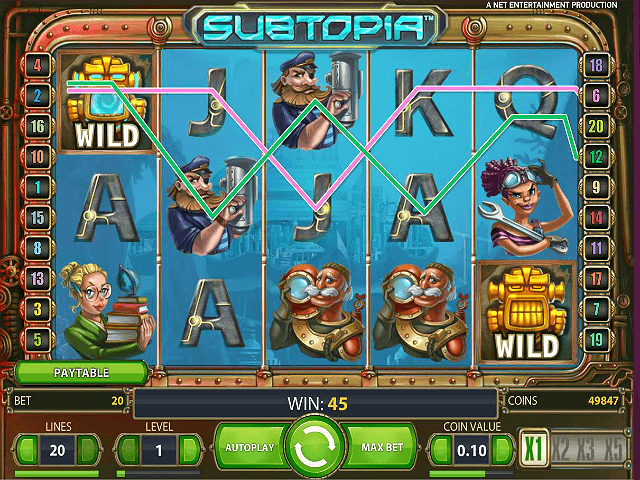 If you like Subtopia, you'll love these slot titles too!